Wow, I’m late for posting this one – didn’t realize Dec arrived so soon after Thanksgiving! 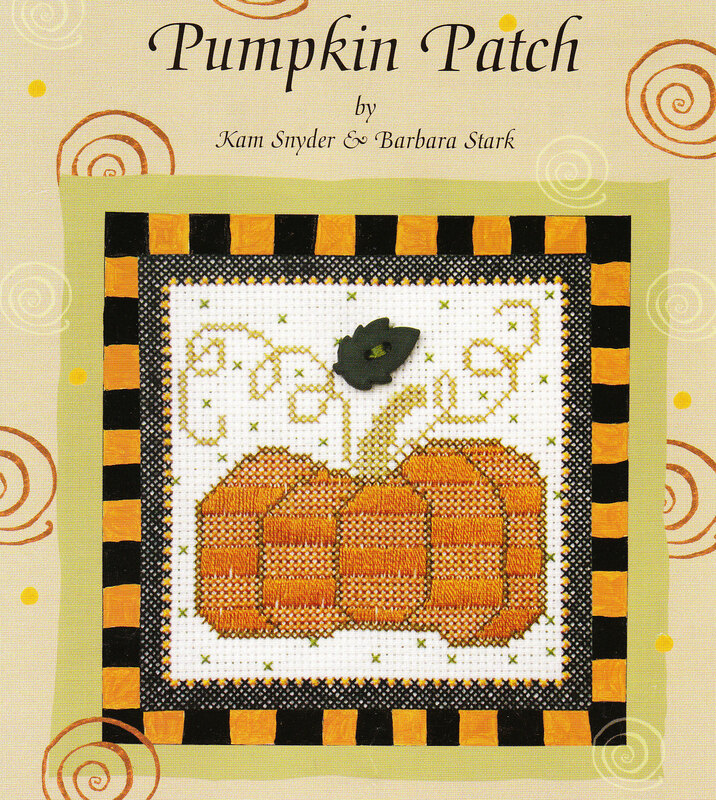 Except for stitching stars for the buttons, I stuck to the pattern for this one. Happy Holidays to one & all. 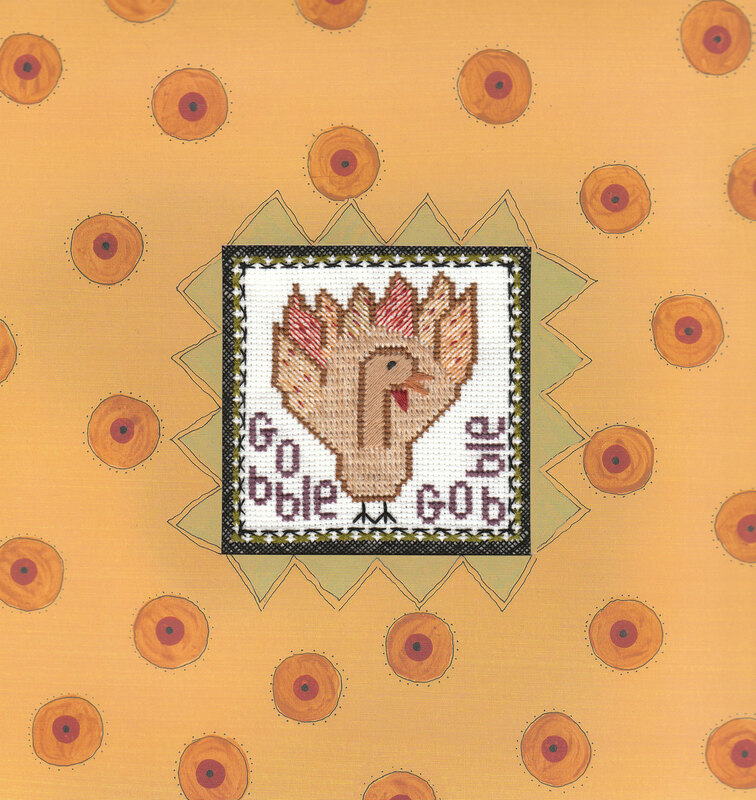 Nothing says Thanksgiving like a turkey. 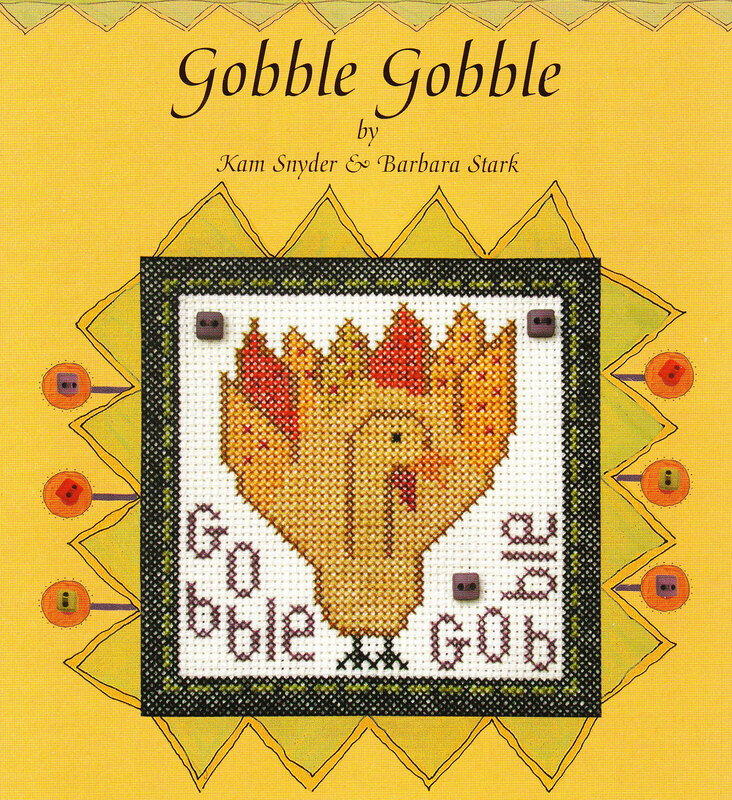 So, I kept the design but used some large Gobelin stitches at different angles to create depth. 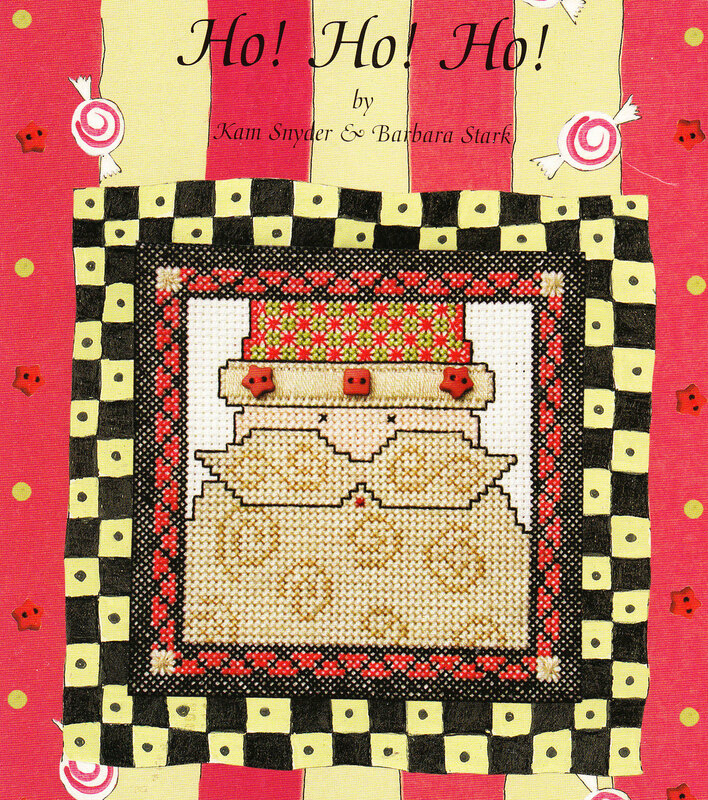 And, to work up quicker than all cross stitches! For the main body, I went browner on the threads. 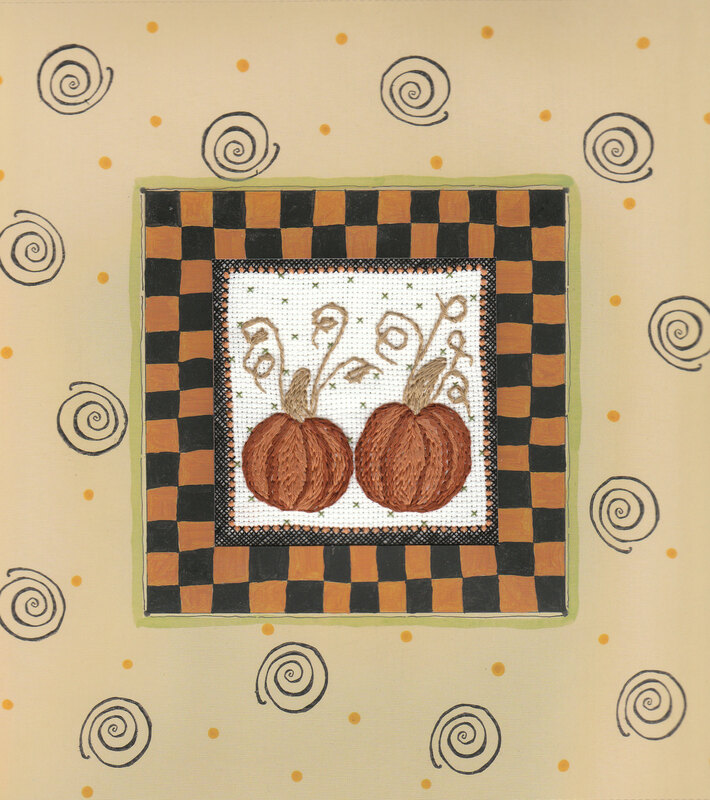 For October, I kept the pumpkins but used an encroaching gobelin stitch & a simple stem stitch. 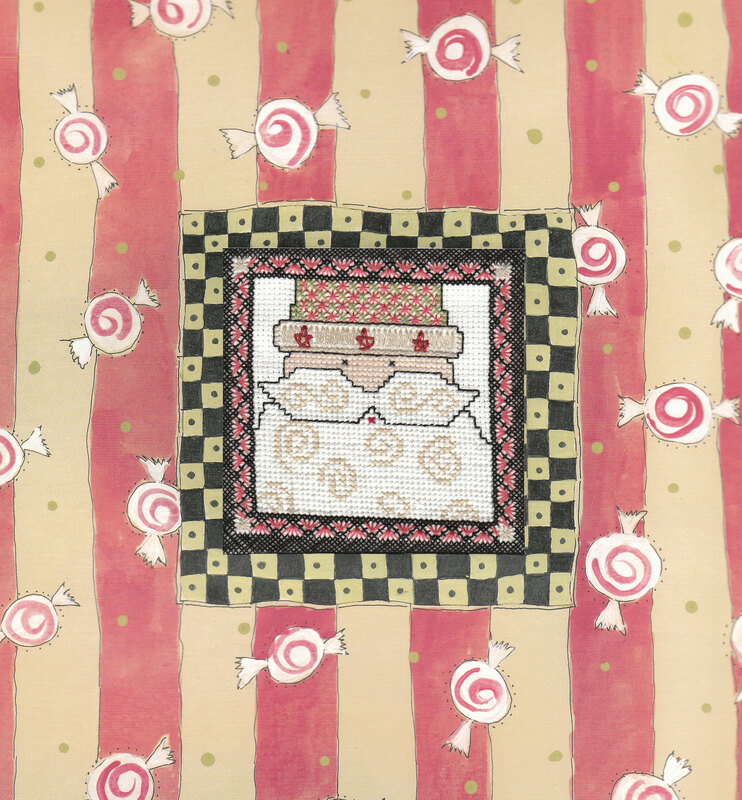 I used a light & dark combination of threads to help create the shading. 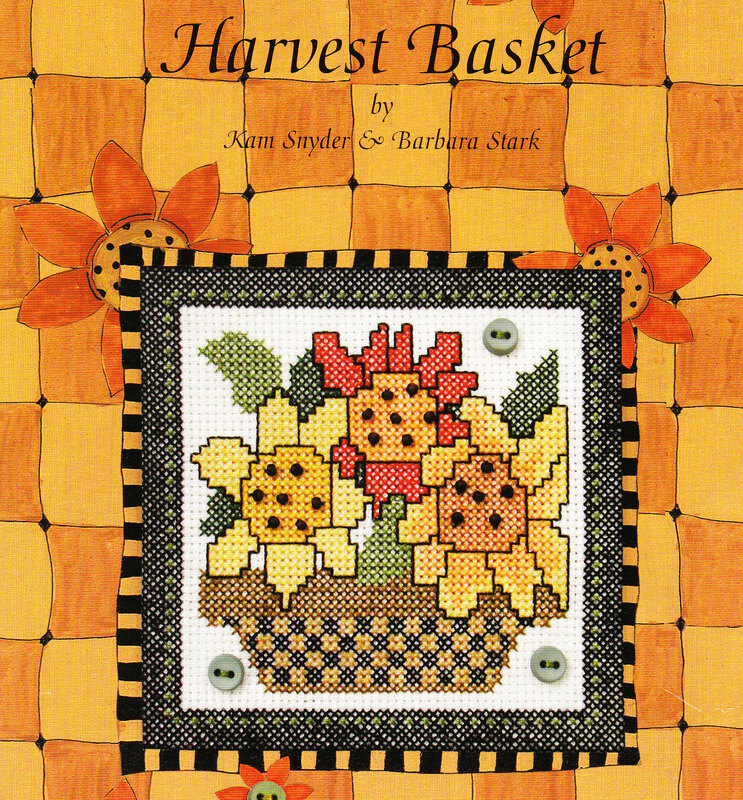 September’s flower basket seemed fine in cross-stitch. So, I stuck with the design except for the buttons. Enjoy the rest of the summer & last blooms! 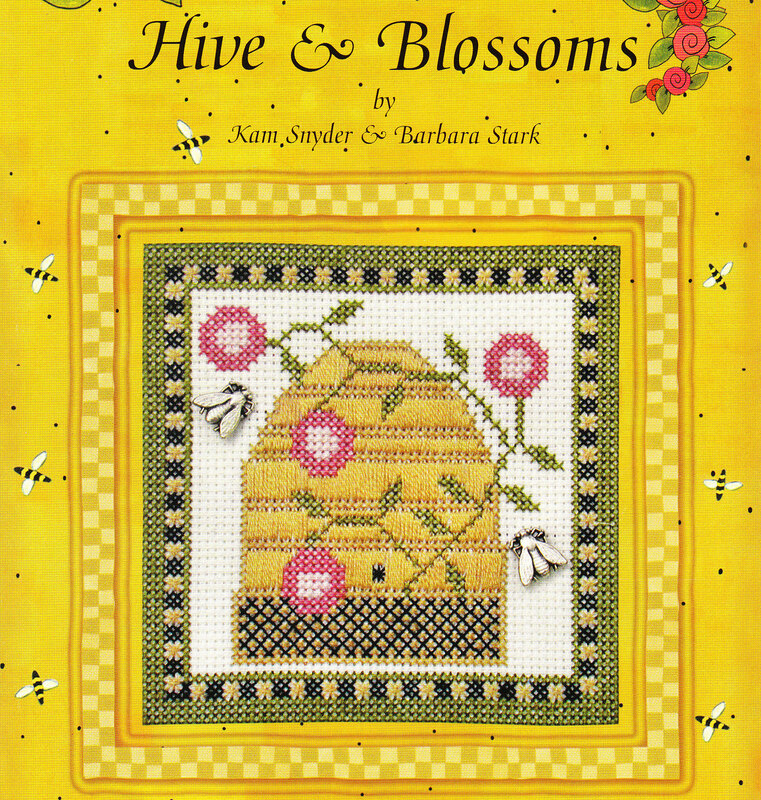 Summer is very busy – like these bees! 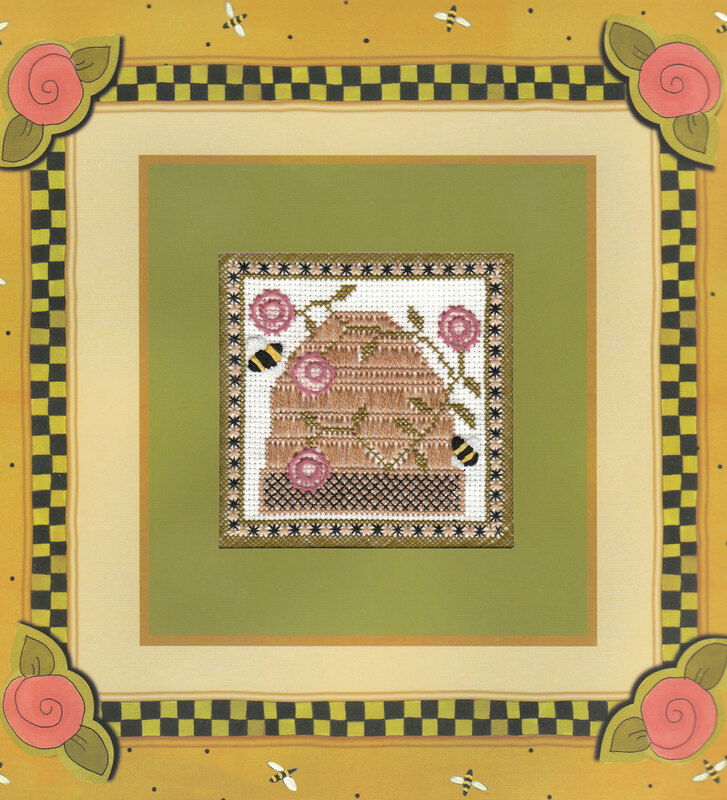 I stayed with this design and only changed flowers & bees. 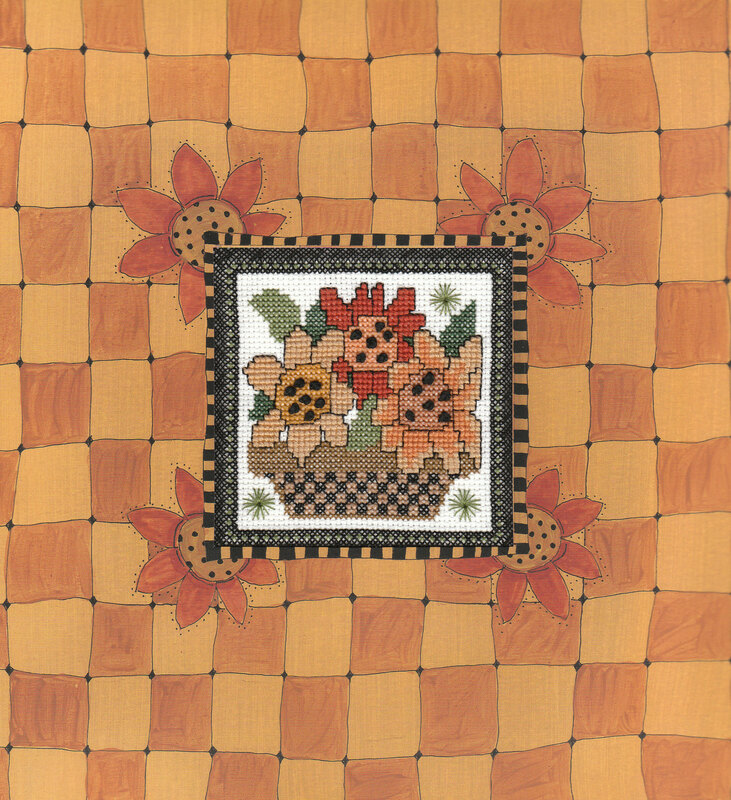 The flowers are Jessica surrounded by a stem stitch. And, the bees are padded satin. Enjoy the rest of the summer everyone! 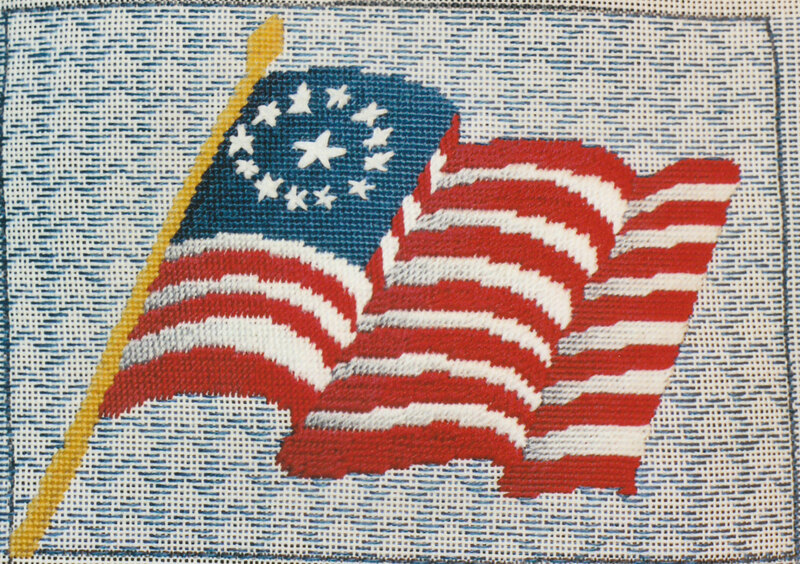 I unearthed photos of the flag I did for our Chapter project (ANG Main Line Stitchers in Wayne, PA). 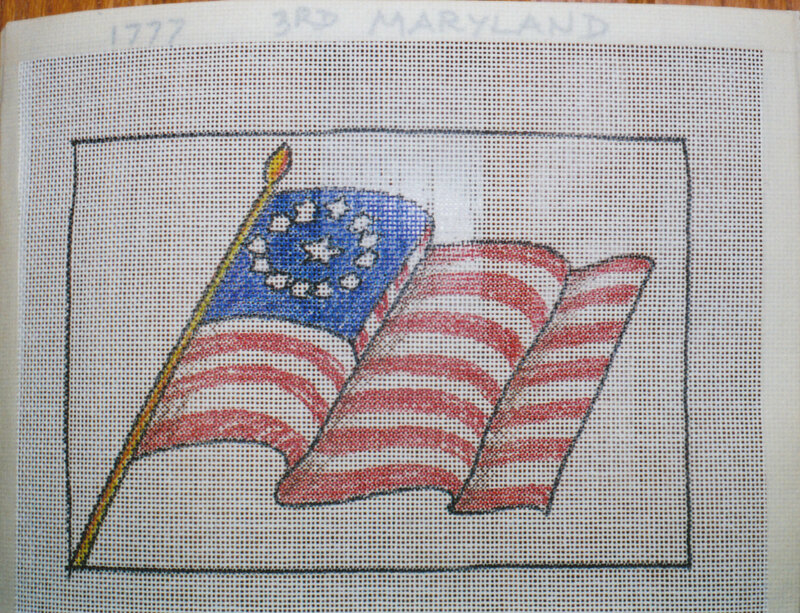 I had the 1777 Maryland flag. Marnie sketched them for everyone. Not everyone has finished stitching & funds for the intended museum ran out. So, this is still an ongoing project. Another flag-waving holiday! What better time than now to remember our soldiers fighting overseas, but also soldiers long gone – may they never be forgotten. 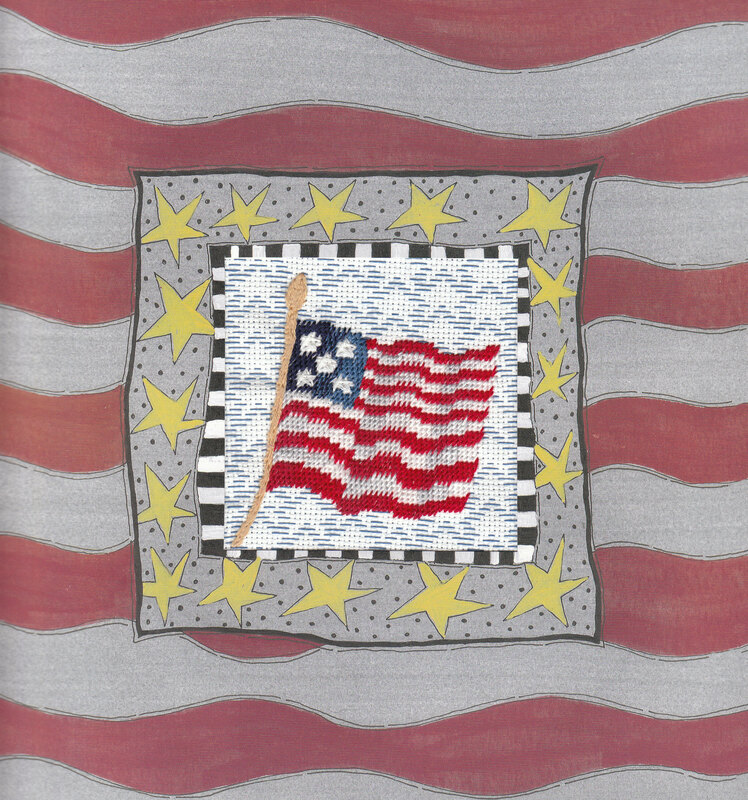 Our ANG Chapter (Main Line Stitchers) is working on a project to donate to a museum of a piece with a soldier surrounded by different flags from the Revolutionary War. I forget what State mine was but it was a larger version of the one for my calendar. I used slanted Gobelin for the flag. 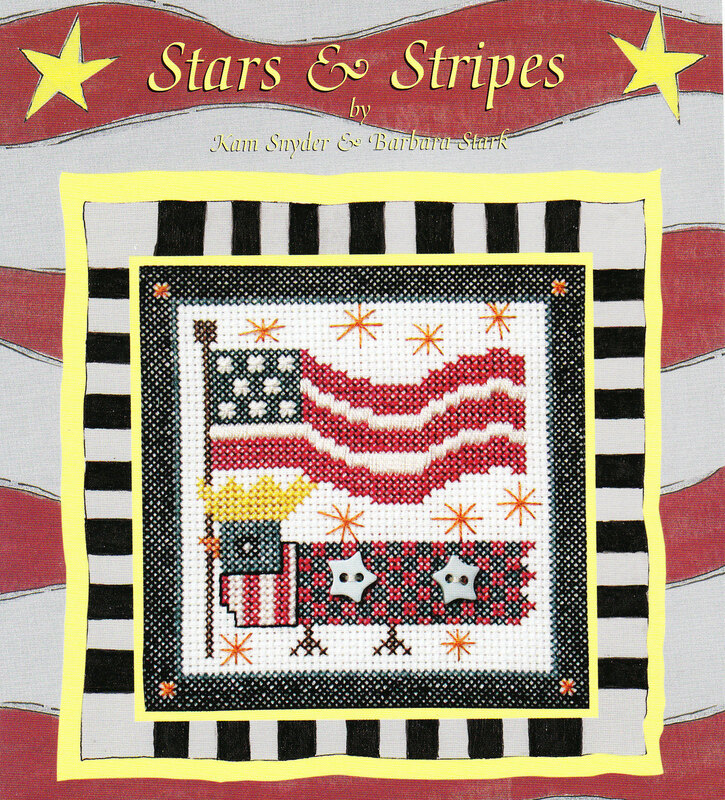 All of the flags used a star pattern darning stitch for the background. I find darning patterns a difficult stitch to compensate (have to pay less attention to TV!). Enjoy the holiday & family & friends . . . because soldiers made that possible.